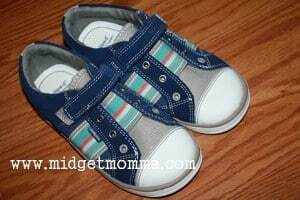 I know you have all heard me very often say that I am a stickler for what shoes I will but on my kids feet, they have such cute and little feet and even as babies I was a stickler because I want them to have good solid shoes but I want them to move with my kids feet at the same time. As you can see in the picture I can easily with one hand bend the shoe (and take a photo with the other hand) so the Pediped Flex sneakers.I also look for durability, are they going to be torn up after my son (who is hard on his shoes) wears them. We have had no problems with him beating these up I can easily wiped them down with a wash cloth and get the scuffs off the toes. The sneakers in the picture are Pedi Peds Jones Blue Sneakers and of course along with flexability in shoes I also look for comfort, my son says he loves them and that they are “comfy” and I like that they also match just about everything in his closet. Jones is a sport style with a casual twist. Jones features two tones of blue and fun stripes across the top and down the sides. Features Flex Fit System™, which allows children to adjust the fit of their shoes and prolong the length of wear. You can purchase Pedi Ped shoes on their website or at online retailers like Amazon . Disclaimer: I was provided this product free of charge to facilitate my review, no compensation was received for this review. All opinions are as always 100% my own.